Technically, facial hair removal creams are not especially groundbreaking. However, Procter & Gamble released a brand new cream that might change people’s minds. The Olay Smooth Finish Facial Hair Remover Duo is a safe, odorless alternative for the average person looking for an easy-to-find hair removal cream. As some people know, hair removal creams usually consist of alkaline chemicals, such as sodium thioglycolate or strontium sulfide. These compounds break down the chemical bonds that hold the protein structure of the hair together. This allows the hair to shed itself from the follicle. Most depilatory creams carry a nasty smell after people apply it on their body. This is because the chemical reaction between calcium thioglycolate and sodium hydroxide often produces a sulfuric odor. Many depilatory (hair removing) creams come with an additional lotion to mask the smell of the depilatory agent. Unfortunately, many of the additional lotions tend to irritate people’s skin for a few days after using them. This includes lotions such as the one in the Nair Precision Face and Upper Lip Hair Removal Kit. The moisturizer actually makes some customers’ skin turn dry, red and irritated for a week. Thankfully, Olay’s Hair Remover Duo avoids this problem by using a skin guarding balm stick. This moisturizer consists of active ingredients such as a wax blend of Ozokerite and beeswax, a Tri-K Glossamer and a sucrose polycottonseedate. Although it’s a little hard to explain what each active ingredient does, it helps to protect the facial skin from any irritation. In step two, the person then applies the hair removal cream over the skin guarding balm. The cream’s main ingredient is calcium thioglycolate hydroxide. This is the chemical that weakens the keratin structure of the hair, removing the hair from its follicle. After about six to eight minutes, people can remove the hair with a tissue or a cotton ball. Finally, people can then rinse the remaining cream and hair off with lukewarm water. Unlike other hair removal creams, the Hair Remover Duo removes hair after only one application. 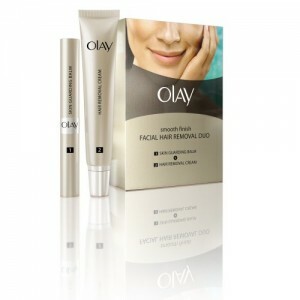 Although the hair will eventually grow back, Olay’s hair removal cream is much more exceptional than previous creams. The skin guarding balm masks the awful smell of the cream and it keeps the skin from potential irritation. The cream removes the hair to keep the skin smooth and bare. Olay’s Hair Remover Duo is fairly expensive, though. Compared to brands that are less than $10, Olay’s hair removal kit costs an expensive $30. However, keep in mind that this is one of the best hair removal creams on the market. The kit is an exceptional, high quality product that will keep everyone satisfied. Although the Hair Remover Duo isn’t cheap, it provides customers with an odorless alternative to other hair removal creams. Best of all, the two-step process is free of irritation as long as people follow the instructions properly. There’s no reason not to try out Olay’s new product.